Wed Jan 24 - general, Thu Jan 25 - Tape Team, Sat Jan 27 - 4th Sat. 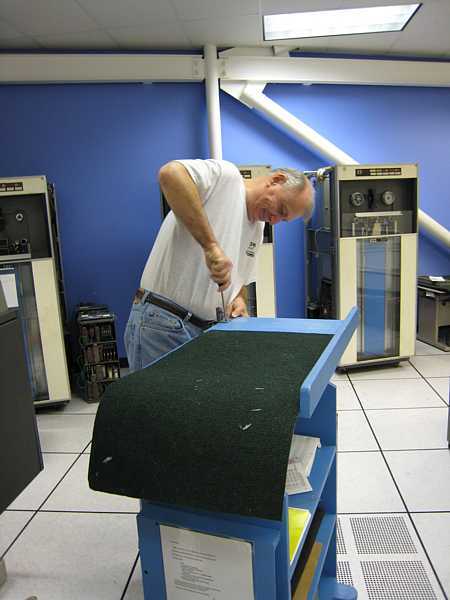 In the morning, Bill Flora ran the 1402 Card Reader Ripple Test again with no failures. 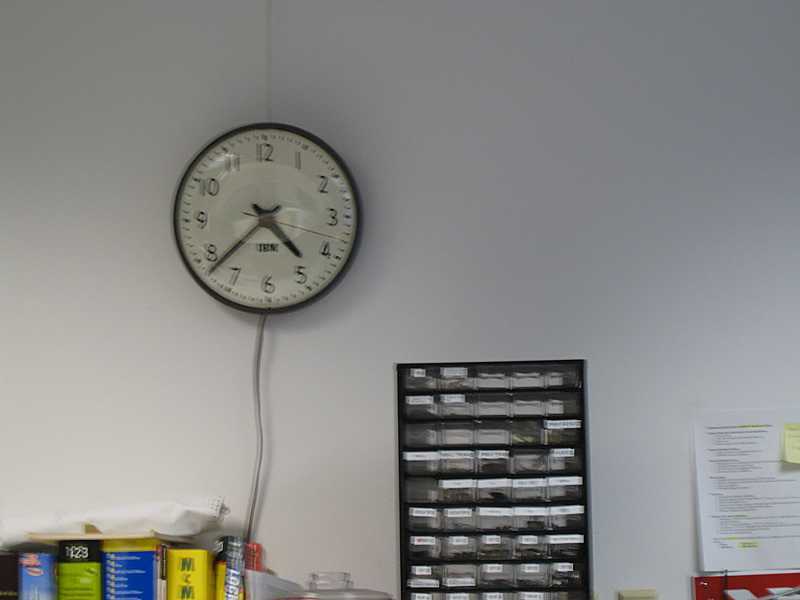 Allen Palmer ("Mr. Neat") has installed a pegboard for hanging his tools. Woz (w/ John [Toole]) did stop by for about half an hour! He totally enjoyed the system, asked lots of questions, and had many interesting observations. "the working 1401 will be the best part of the Museum"! 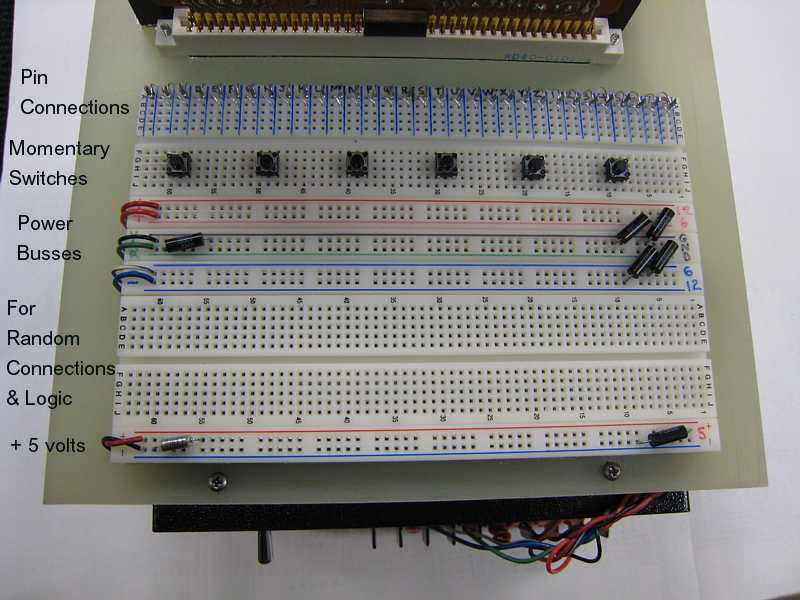 He thought the 1401 classes should begin with transistors, SMS cards and on up! Perhaps because we had the system off for several hours (putting 1402 skins back on) and it hadn't warmed up? I asked Bill to give Ron a call tonight on 1402 status. Also, Allen noted that the TAU causes the 729 to stretch tapes (again). p.s. We need Ron's "power's of 2" print program next to the 1401 so we can toggle it in on short notice. The "tape stretching" that was reported yesterday was not a problem for us. We "loaded" tape about a dozen times today. The tape was smoothly drawn into the columns every time except once. That time the supply column stuttered once then loaded. We observed that the TAU's skew and error indicators were stuck on. This was a new problem that cropped up sometime in the last three weeks. We traced the problem to two bad cards (a 3-input NOR on one card and a 2-input NOR on the other). These two NOR gates are cross wired to form a set-reset latch. The outputs of each of these gates were stuck minus (-5.8 volts). Either of these gates having its output stuck minus would cause the observed failure. It is curious that both of these cards (card bags labeled 02b3c15 & 02b3f15) failed within three weeks of each other. Coincidence??? During the last work session I fixed a card punch error in the Move Tape (5040) diagnostic, but was unable to verify the fix. Today, we loaded and verified this fix. We set the sense switches to continuously repeat the Move Tape diagnostic and ran it for nearly the entire length of a tape. 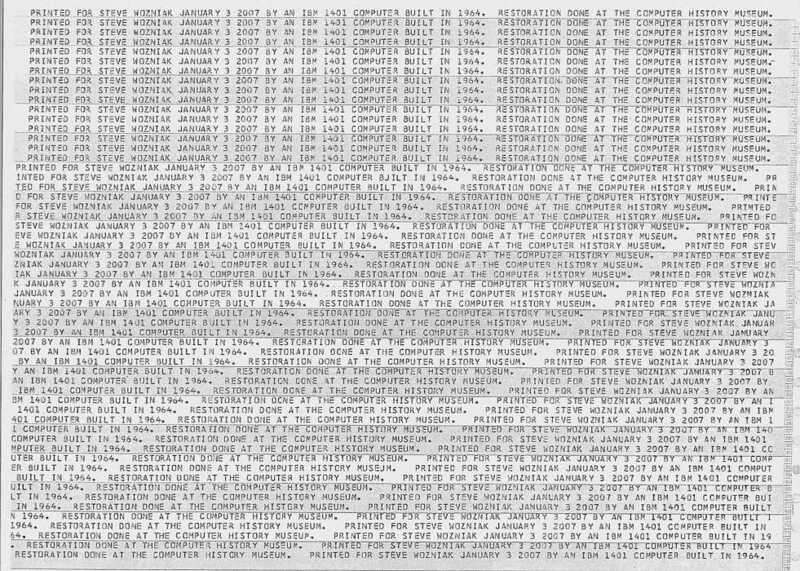 (about 10,000 fifteen-character records) For this diag, a record is written, the tape is backspaced, the record is read and compared, and then the sequence is repeated with a different record. Sixteen error clusters occurred. Each cluster consisted of three to eight consecutive failing records. Eight of the clusters showed a write/read data compare failures on the first record of the cluster. No other data compare failures occurred. Other errors were parity or skew errors. On most data compare errors, a single bit was picked or dropped. Picking the A-bit was most common, but sometimes the A-bit was dropped. Sometimes the entire record was trashed. Scoping the OR of the received clipped data bits shows that all bits of a character arrive within a 2.5 microsecond window. We were running at 556 cpi density (about a 22 microsecond character frame). I don't know if this is within specifications, but at least one skew error was reported. Frequent CPU A-Reg errors occurred. (TAU read data is delivered to the A-Reg.) The error indicator glowed dimly during the entire run. These errors were not being reported in the TAU error indicators nor printer report. 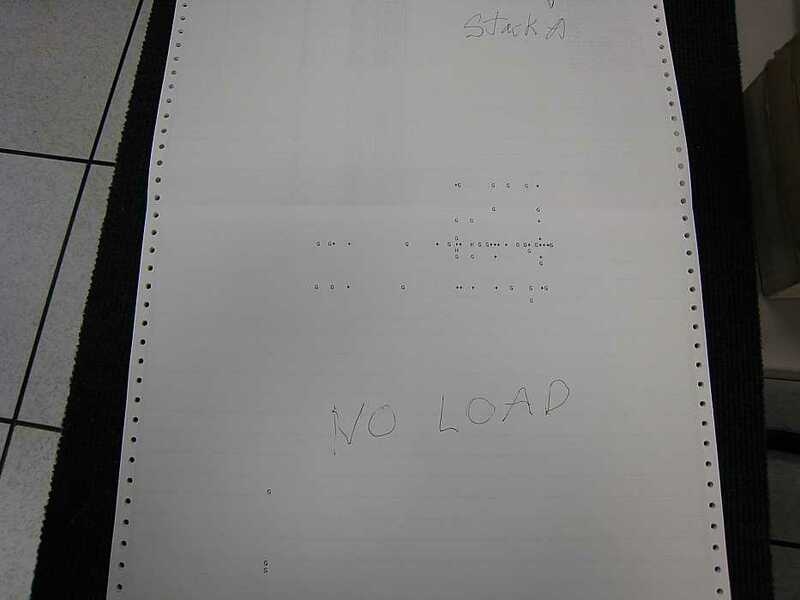 Printing an error report line often turned on the "Printer Check". The diagnostic finally crashed when the 1401 CPU branched into the print buffer (201- 332) and loaded a Group Mark as an opcode. The error report showed that a longer than 15-character record was read just before the crash. 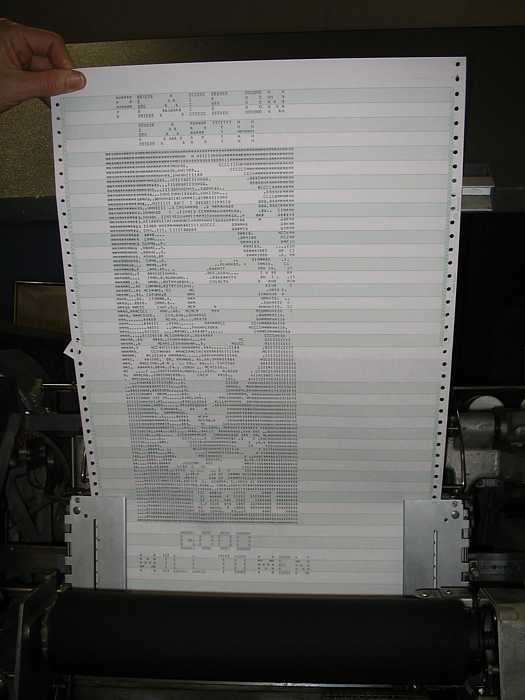 Data read from the tape is transferred directly into the print buffer. 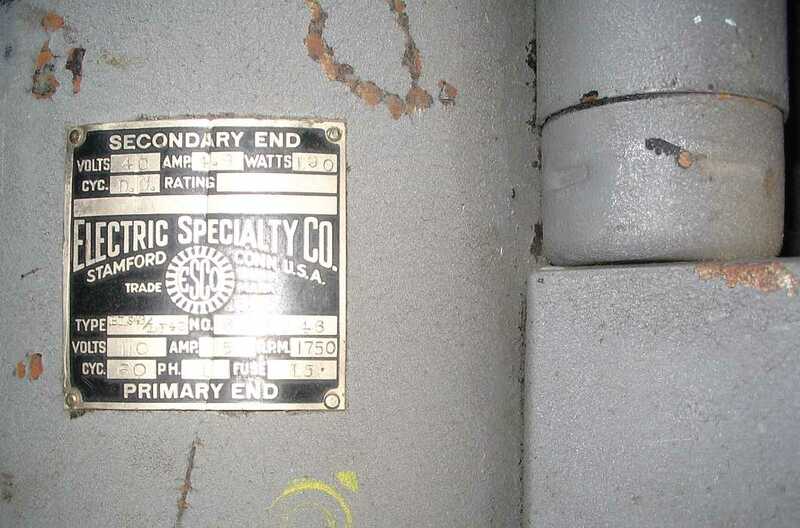 The program starts at about address 400. 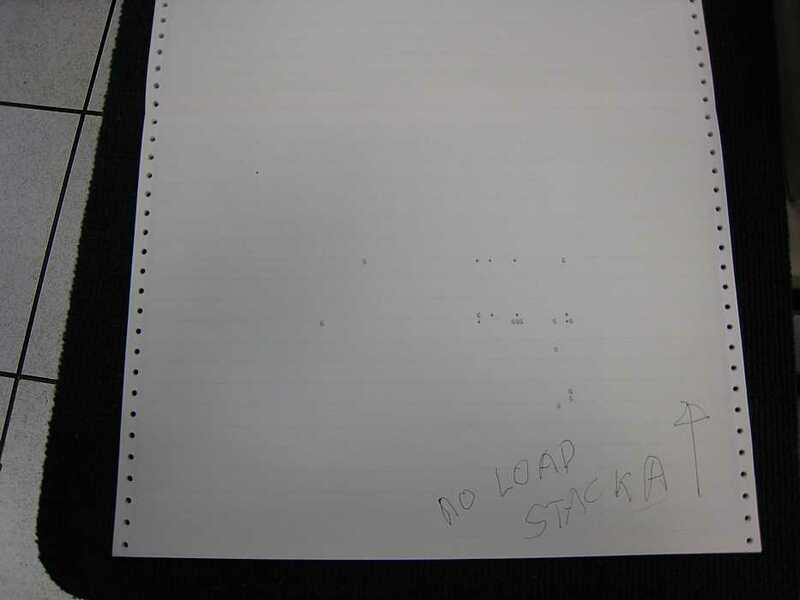 It is possible that the erroneously large incoming record trashed the beginning of the program, but a Group Mark with a Word Mark should have protected the program. We disparately need spare TAU SMS cards. There were no TAU cards in the Repaired Cards box. Only two TAU cards were in the BAD Cards box. I found a batch of bagged bad TAU cards in the rolling shelf unit. It looks like they were removed from the Bad Cards box so that they would get higher repair priority, but put aside and forgotten. I placed them back into the Bad Cards box (they are all labeled TAU). We would appreciate getting these cards repaired ASAP. Present were Ron Williams, Bob Erickson, Ed Thelen, Frank King, Chuck Kantmann, Bill Flora, Allen Palmer, Robert Garner. We came in and were shocked to find Allen's neat corner even neater. This is not fair!! I mean like humiliating. 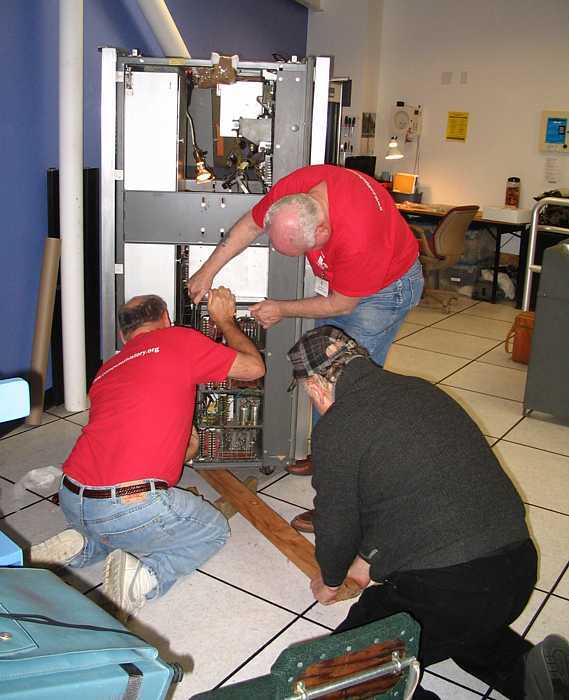 After that power supply was connected, Allen got Frank King and Bill Flora to help lift another power supply into another 729 tape drive. Ron Williams stood by with 2x4s, ready to play Archimedes. Sounds simple and quick for folks used to 8 pound PC power supplies - BUT we are dealing with ?250? heavy honkers (I'm bringing a bathroom scale Saturday to weigh one) that are big and clumsy. Get a finger under that turkey and the memory will last as long as you do!! Not quite as awkward as an auto engine. 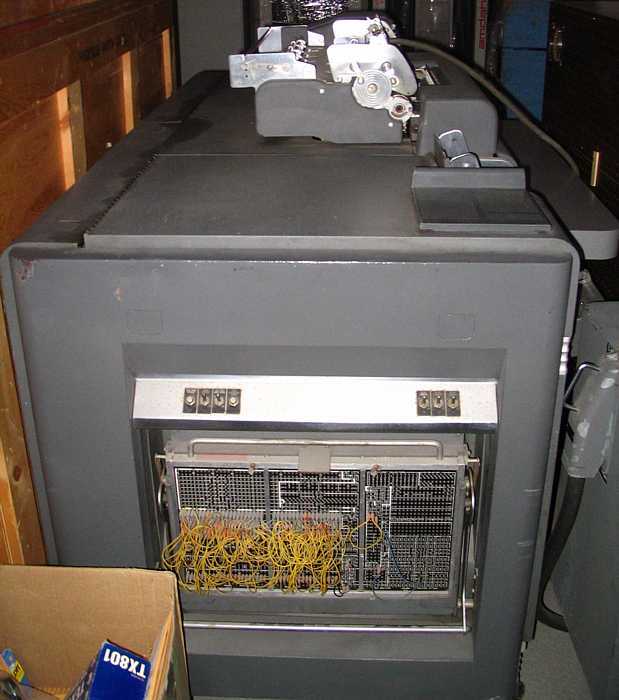 The 1402 had been getting error checks last session after Bill had remounted its covers, just, of course, before Steve Wozniak arrived! 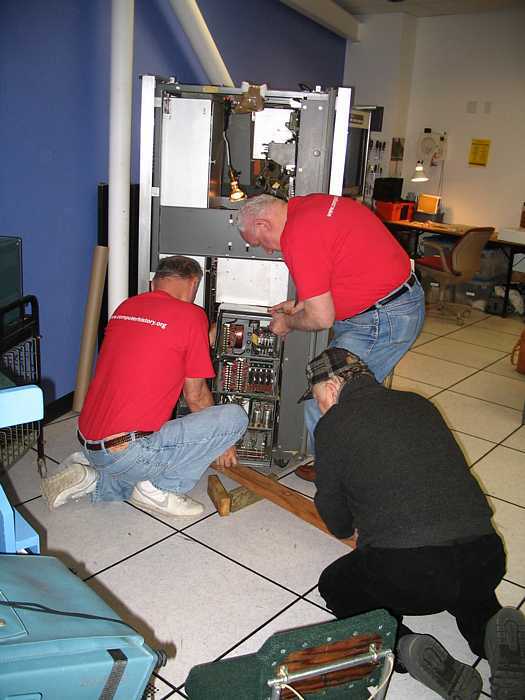 Ron Williams and Bill Flora considered actions: After examining card-to-printer results, they zeroed in on the problem and pushed in a loose control-wire pin in the reader unit. The wire is very taught and installing the cover bumped it loose. Bill remarked the wire should be lengthened. A card of all group marks causes a mis-read. 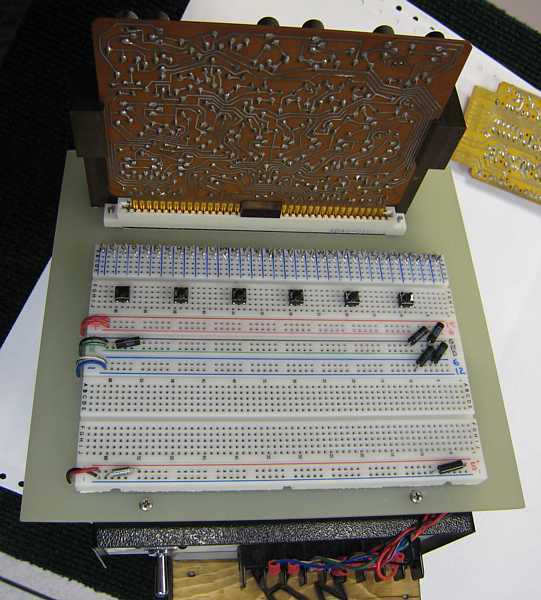 The -21 volt power supply in the 1402 reader drives current through the read brushes and through magnetic core memory during a card read cycle. 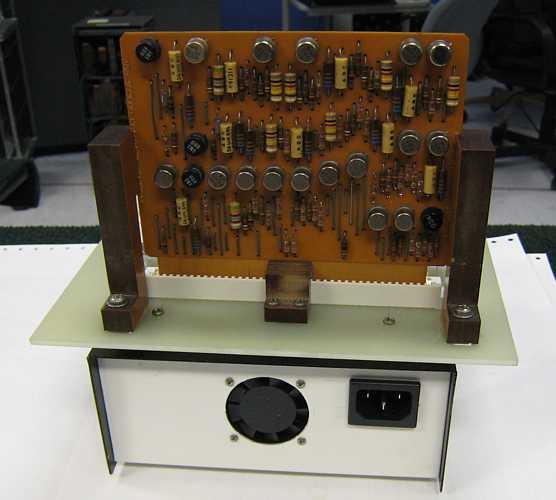 We have discussed measuring currents in memory (voltage across limiting resistors in series with wires through cores). 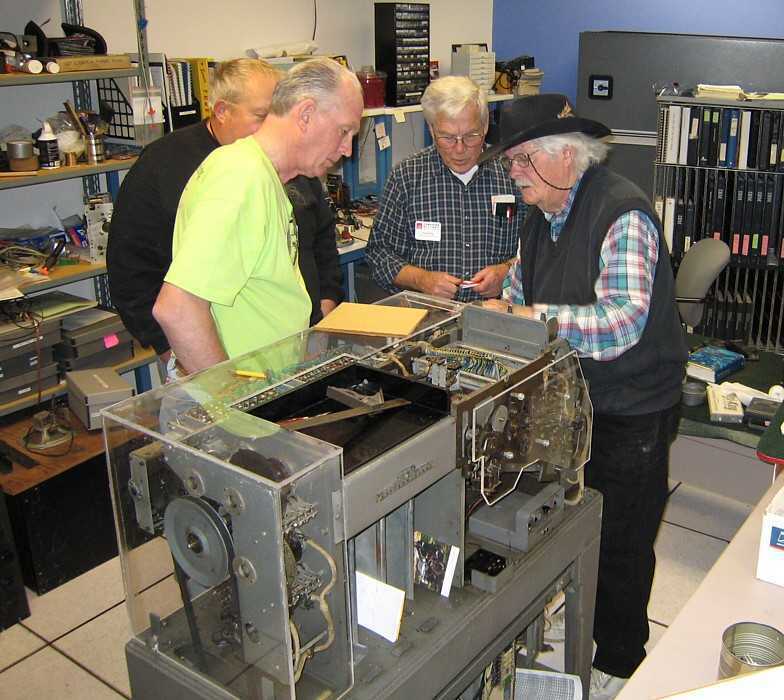 Frank King talked with others about changing the 083 sorter from 50 Hz to 60 Hz. 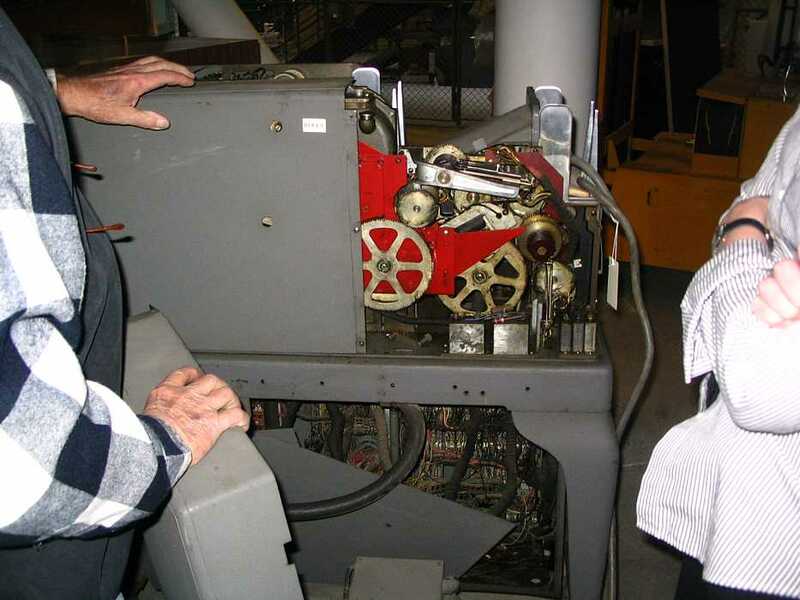 This involves "re-tuning" the feroresonant regulator (we have no experience - but some of us would like some), and changing the drive pulleys due to the higher speed of the motors. 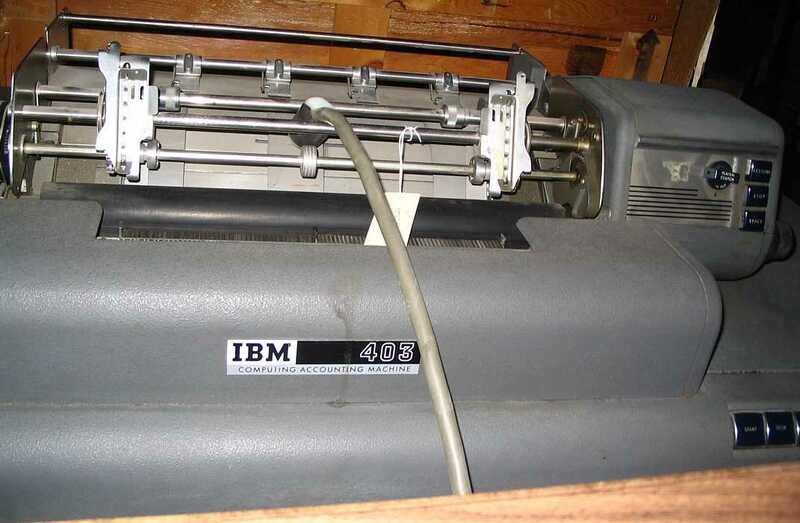 The sorter was left plugged into the utility outlet of the 1402 reader/punch. 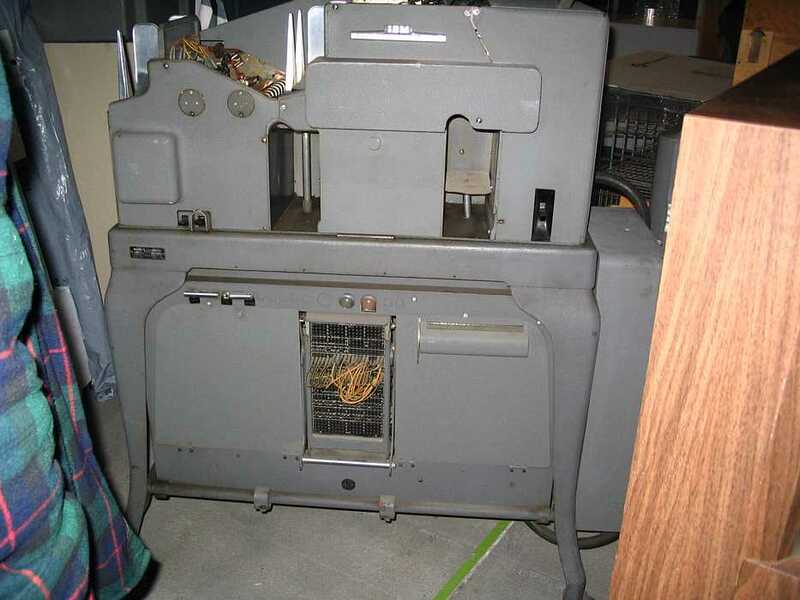 Robert Garner went upstairs to present to the administration Bob Erickson's request to restore a newly arrived IBM 513 duplicating/summary card punch, currently with a newly arrived IBM 403 accounting machine. 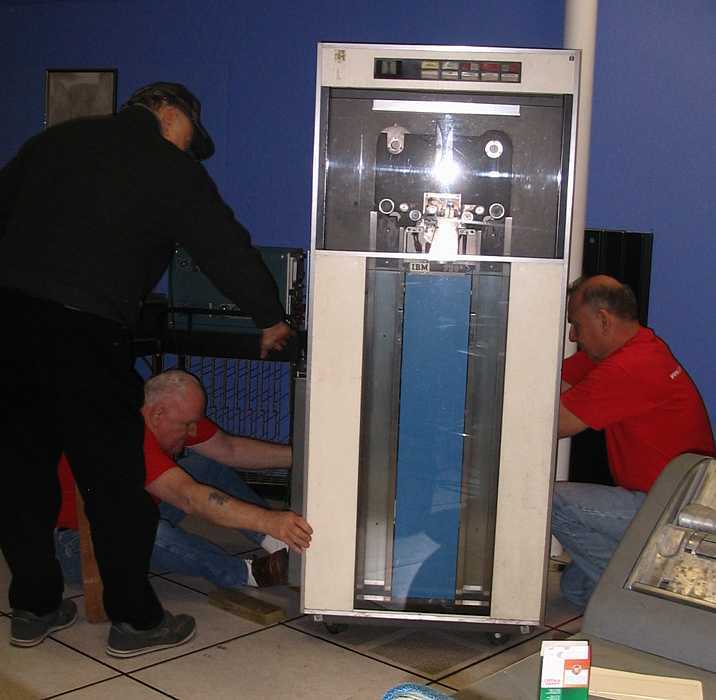 About 2:30 Kirsten Tashev arrived at the 1401 area and went with Bob Erickson into Invisible Storage to view the newly arrived IBM 513 and discuss why restoration for usage by the 1401 team would be a good idea. (Bob watched for this old stuff like a hawk!!) Bob found that the 513 is crankable but rather stiff - maybe 40 years of drying/oxidizing oils and greases are responsible. We were later joined by Al Kossow. 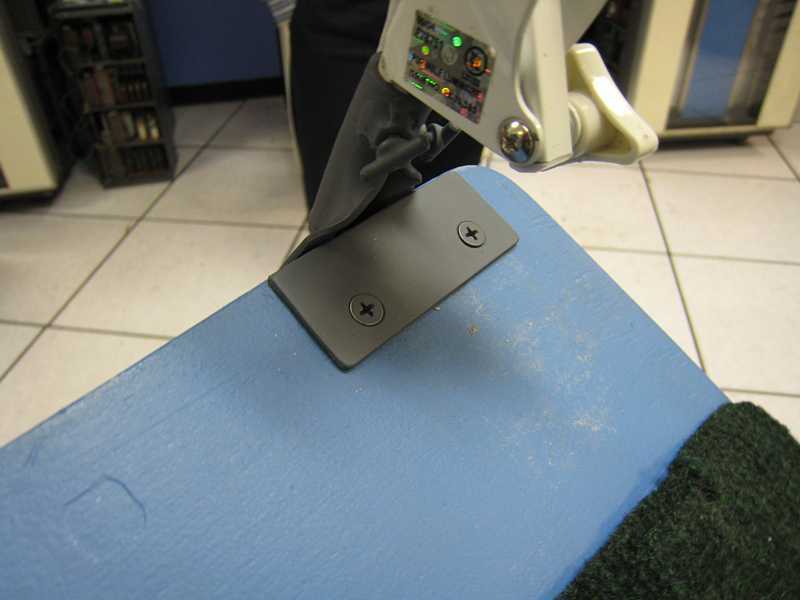 As decks of cards are read through any card reader, even the 1402 card reader, wear occurs and eventually the deck becomes marginally readable and should be reproduced. Kirsten asked why the 1401 reader/punch (the 1402) could not be used to do this necessary reproduction? 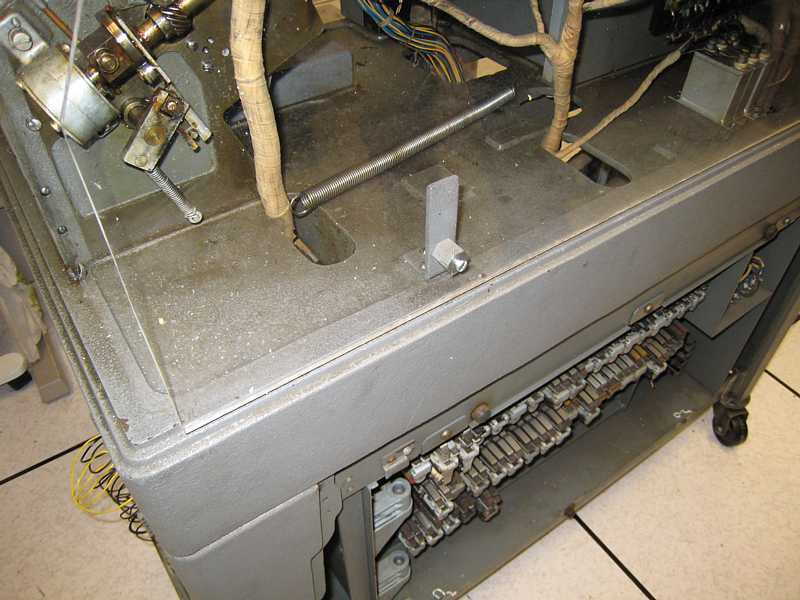 Bob answered that the 1402 punch is not as robust as the punch unit in a reproducing punch. A likeness of an old fashioned "Tab Room" would be incomplete with out a reproducing punch. Robert Garner wants me to get the simulator demo program punched via ?CardAMation? and available for demo. I mentioned that the card reading was faked, as the simulator in ROPE does not currently support card input. (Ron Mak proposes a work-around.) 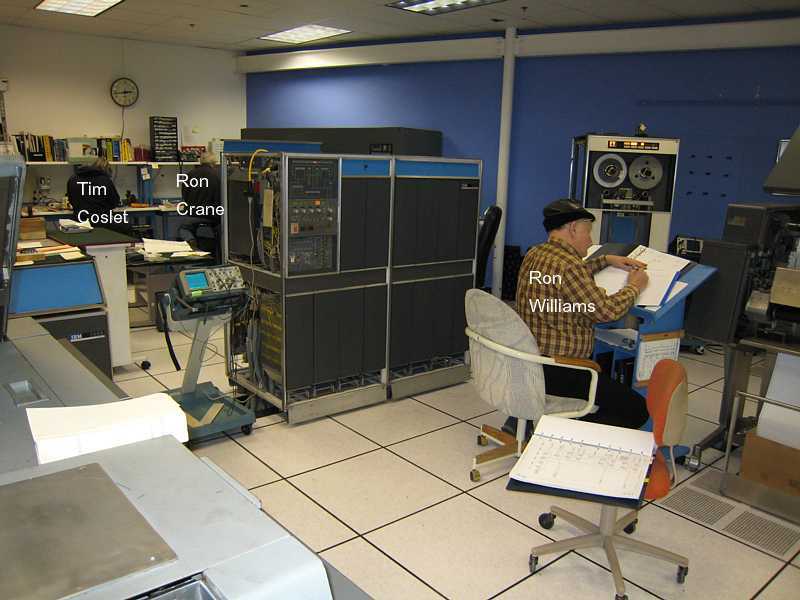 Robert suggests that Ron Williams visually check the card reading code, assemble it in ROPE, give the results to Bob Feretich for conversion to whatever, then to CardAMation, and hand fix anything necessary. Will try soon. We started out a few steps back again today. Characters that we read were received with their 8-bits set to zero. The failure was consistent so it was not too difficult to troubleshoot. 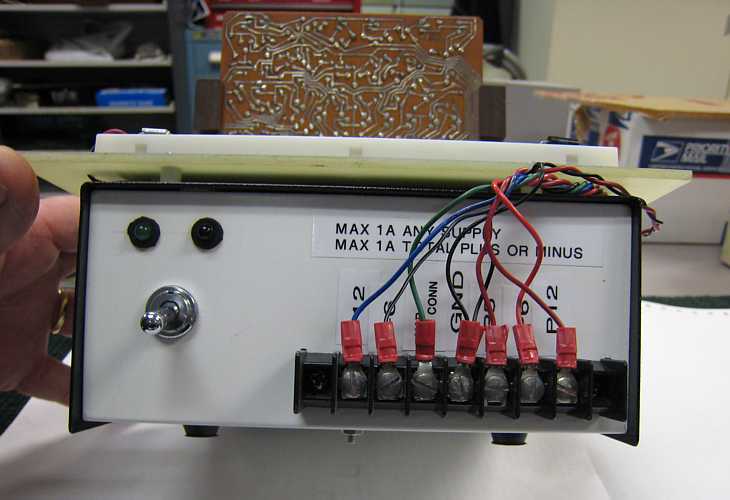 We isolated the problem to a jumper wire on the back of the 729's read amplifier gate. The pin socket that was crimped onto the wire was failing. Wiggling the wire at the socket made and broke the connection. There was even a state that passed an attenuated signal. This may have been responsible for some of the intermittent errors that we saw in previous weeks. 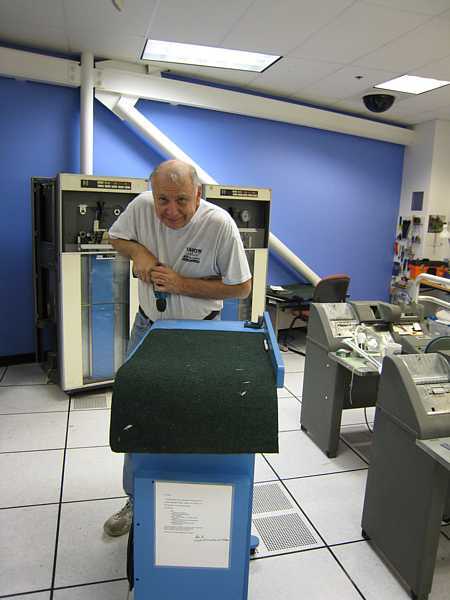 We then ran the Move Tape diagnostic (5040) for a good portion of the tape without error. Previously this diagnostic seemed to cause a large number of 1401 A-Reg parity errors. None of these errors occurred during this run. We ran the Card-to-Tape (5000). Eight to sixteen errors were reported each time we ran the test. The most common error seemed to be TAU compare errors with the TAU's A-Reg set to 0000001 and its B-Reg set to 0000000. Neither of these characters are legal, so we think that the TAU is sampling data when it not supposed to. These errors occur on the read back part of Write instructions. The error is probably occurring in the read back timing. 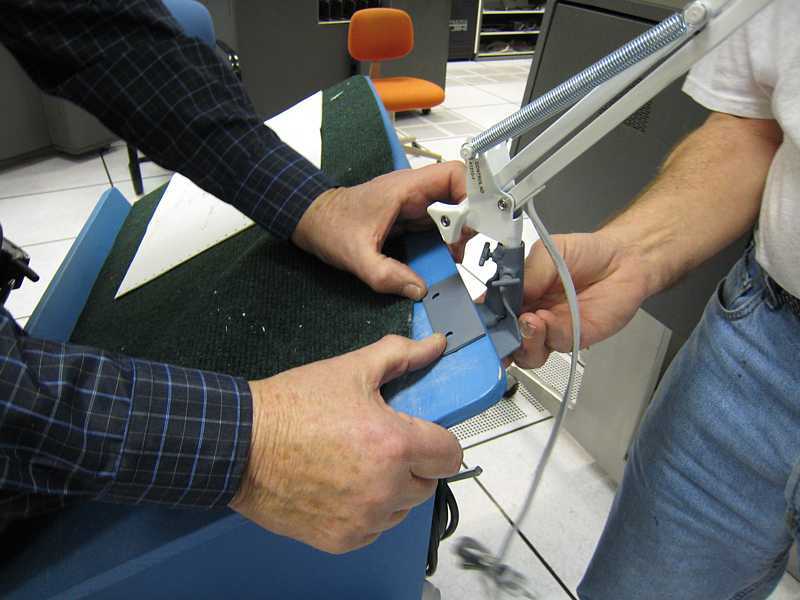 The primary difference between this test and Move Tape is that the tape operations in Move Tape occur more quickly so the tape flows smoothly. Card-to-Tape incurs a card read delay between each record, causing the tape prolays to chatter. We checked the Write Delay and the Write Disconnect Delay. They look ok. The root cause is still TBD. We were running Card-to-Tape with the read back sense switch (G) on. 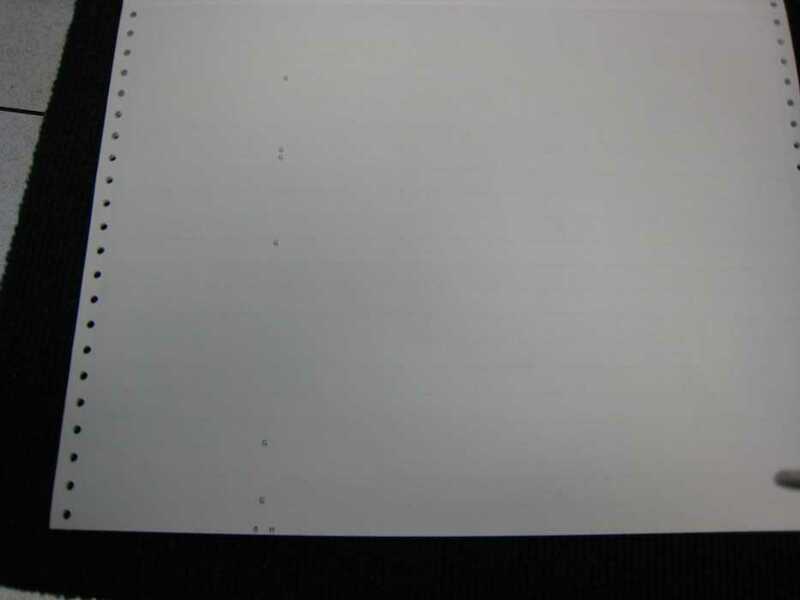 After several minutes of running, the 1401 jumped to execute a Group-Mark with Word-Mark instruction in the print buffer. We verified that the begining of the diagnostic was not corrupted. We also saw this happen once last week with the Move Tape diagnostic. Twice today the 729 lost Ready status for no apparent reason. We ran the tape off the end of the reel. It took a lot of messing with the 729 to reset it after that. (Including a few power off/on cycles.) I am not sure what we did to reset the drive. I have also seen this happen several weeks ago. On occasion, the 729 refused to Unload tape. I think this a problem with the mercury switch on the back of the take-up shaft. I adjusted it so that the contacts were horizontal and the problem went away. Might be a fix or a coincidence. We need to wrap the switch's bulb in something tacky so it neither slides nor rotates in its clip. We accidentally executed a Rewind operation using the address of the 1402 Card Reader. Several cards got mangled as they were sucked up from the output hopper. Present were: Ron Williams, Bob Erickson, Tim Coslet, Ed Thelen, Grant Saviers, Jeff Stutzman and Ron Crane. As promised, we weighed a 729 tape drive power supply - with a bathroom scale. It weighs 140 pounds. Well, OK, that is about 2.3 60 pound bags of cement - and just about as easy to handle. The red line in the right hand screen shot is where the base line should be. The leaking transistor floated the base line (a 'false' value) up (into the 'true' range) confusing the machine. Tim Coslet expressed frustration trying to test the double sized SMS cards with out a test fixture to aid making power and signal connections. 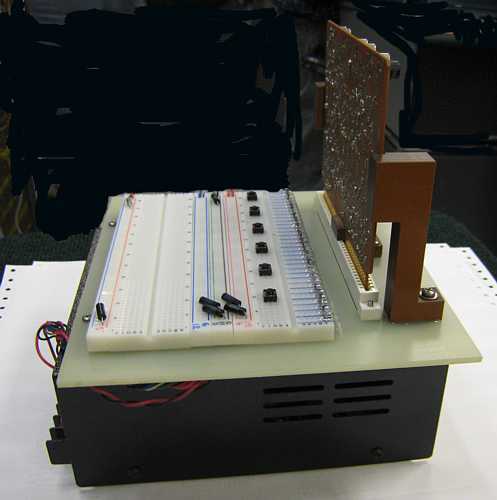 After some discussion, Grant Saviers will make a double wide test fixture somewhat similar to the single size SMS test fixture made by Ron Williams (with lead in the base to increase stability ;-)) Grant plans to use two SMS sockets rather than the green S-100 BUS socket shown. This is an overview of the south west corner of the 1401 room - with some serious folks. 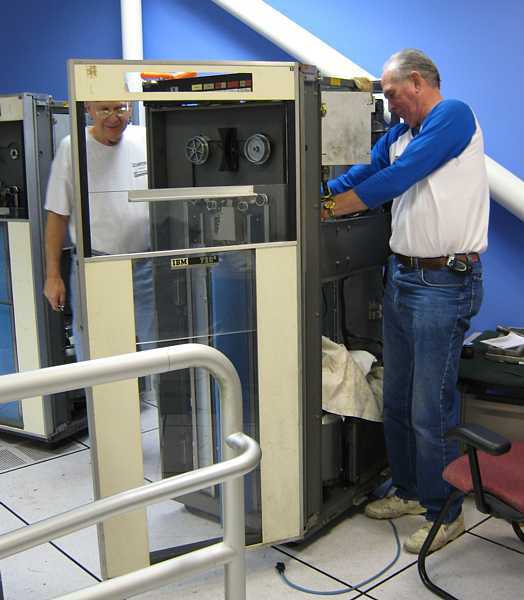 Tim Coslet (left) and Ron Crane are fixing sick SMS cards. And no, the 077 was not modified to install the plastic. 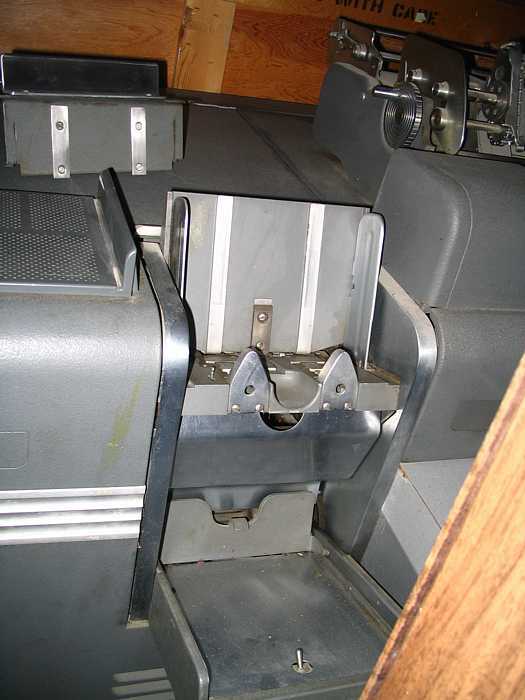 The brackets are part of the machine to secure the normal metal "skins". 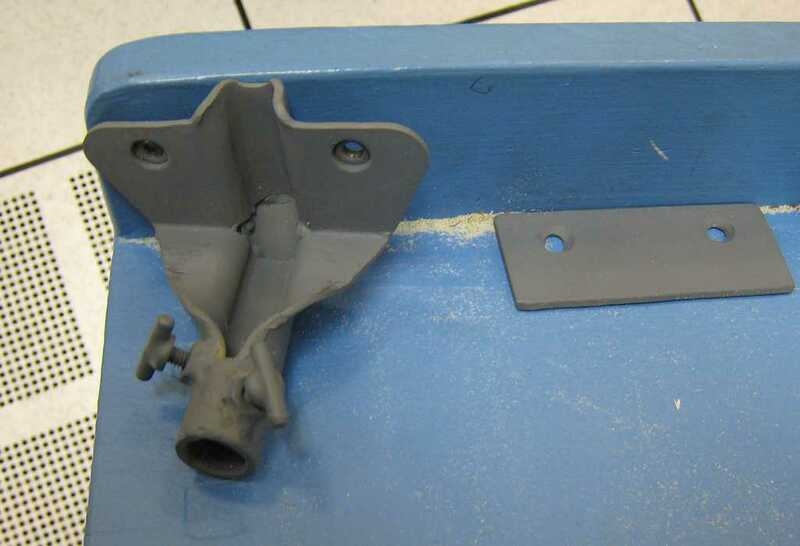 Some extenders were crafted to better place the plastic. Present were Ron Williams, Bob Erickson, Frank King, Glen Lea, Chuck Kantmann, Bill Flora, Robert Garner, Ed Thelen. 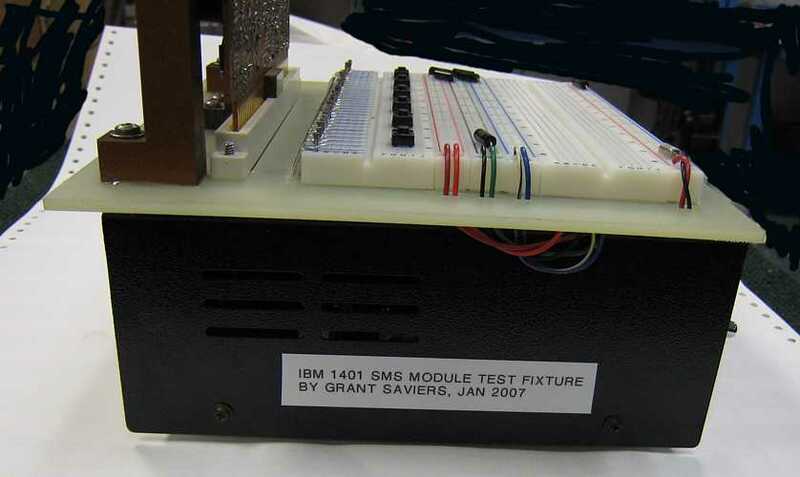 Grant Saviers brought in a "1401 SMS Test Fixture" which we had requested just last week. Talk about prompt design, fabrication and delivery!! There was a hypothesis that sagging 21 volt power supply might be causing the Group Mark sensitivity. 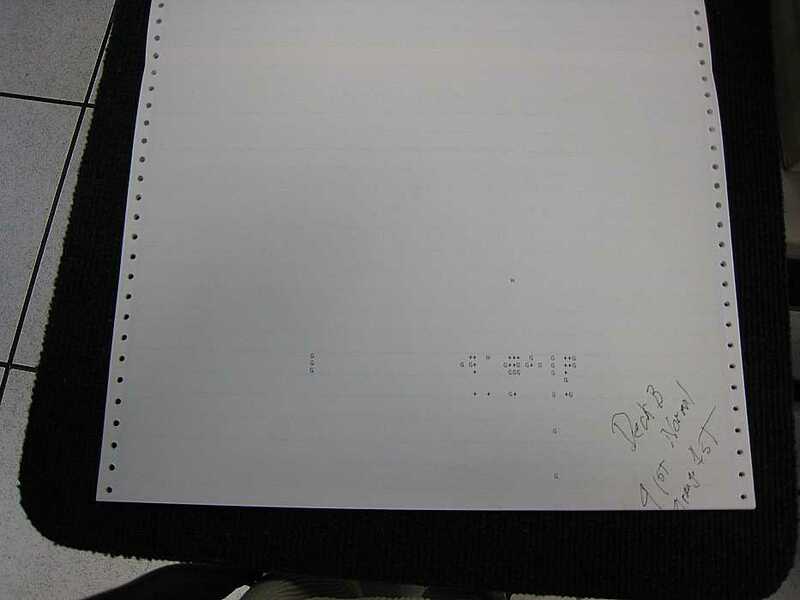 A group mark in a punched card has two successive holes, (eight and seven) and one other hole. Cards with mostly group marks seem[ed] to get misread more than other cards. (A card of all slashes also has successive rows punched out (zero and one)). So we read and printed a deck of cards with all group marks - and watched the output of the 21 volt power supply. The scope, set on DC, 5 volts/cm yielded no apparent sag or other interesting news. 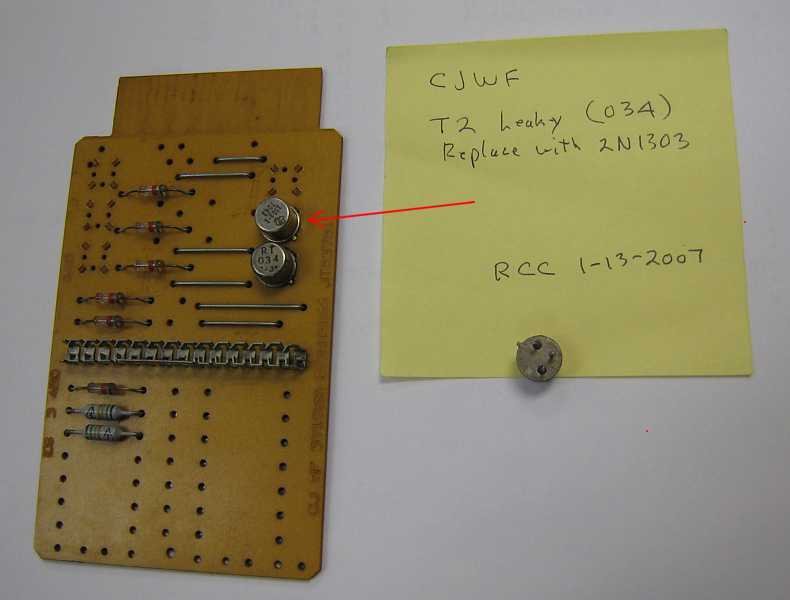 The scope, set on AC, 0.1 volts/cm yielded some 0.03 volt spikes, but that did not seem consistant with reading blank cards vs group mark cards. Placing a additional 0.8 amp steady load across the power supply caused a 0.8 volt DC sag, but no apparent change in the read error rate. 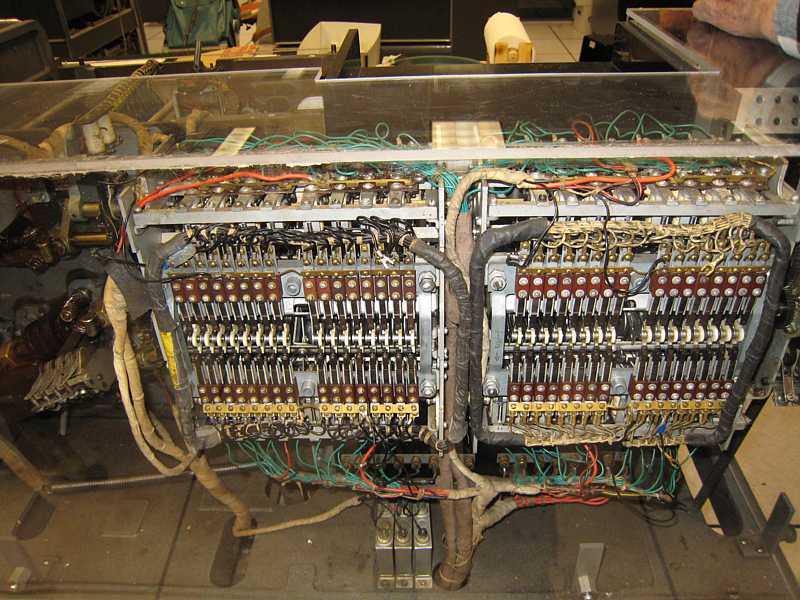 It was also noted that voltage sag was not the likely problem as the row 8 seemed as likely misread as row seven - or even row 12 of the group mark character. Errors were not "random" or "Gaussian". Executive Summary So I (and Ron Williams and Bob Erickson) decided that the 21 volt power supply was not likely the culprit in the bad read error rate. Bob Erickson carefully examined the test deck for hole alignment. It was not particularly good, not bad. Bob suggested we flip the deck side for side (the 80 column is now the 1 column) and most the errors now appeared on the left side of the print out. 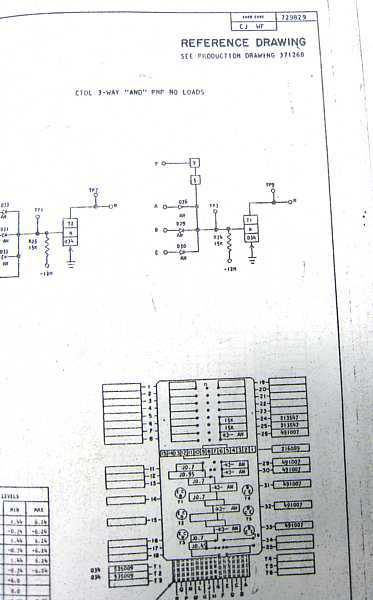 - Previously most of the errors had appeared on the right hand side of the print out. Bob Erickson tried an old CE trick of looking for where the brushes were contacting the card, relative to the holes. 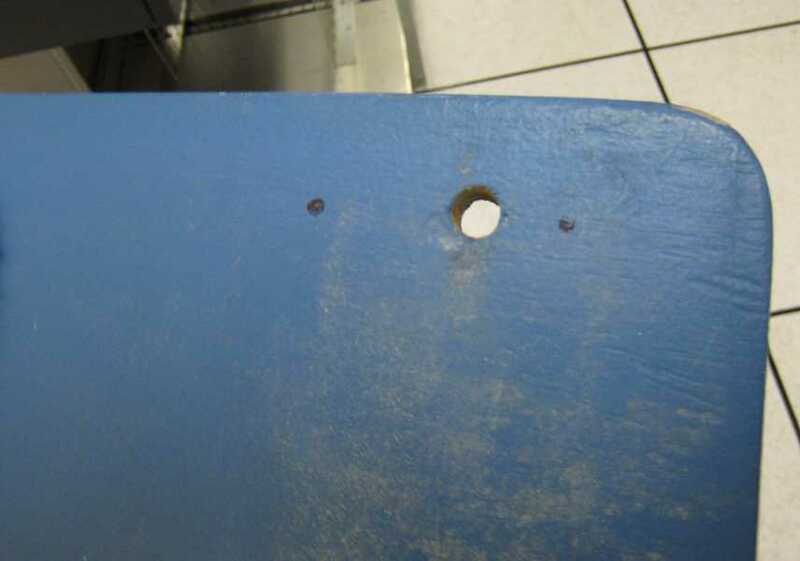 He took some grease and smeared it lightly over a row of holes, and read the card. The brushes dragged some of the grease further down the card, making the brush traces visible. Bob thinks the read brushes are slightly mis-registered relative to a properly punched card. The amount of mis-alignment should not be causing our torment. Ron Williams and Bob Erickson are planning to come in this coming Saturday. - More card reader?? The new sampling scope that Grant brought in works great. 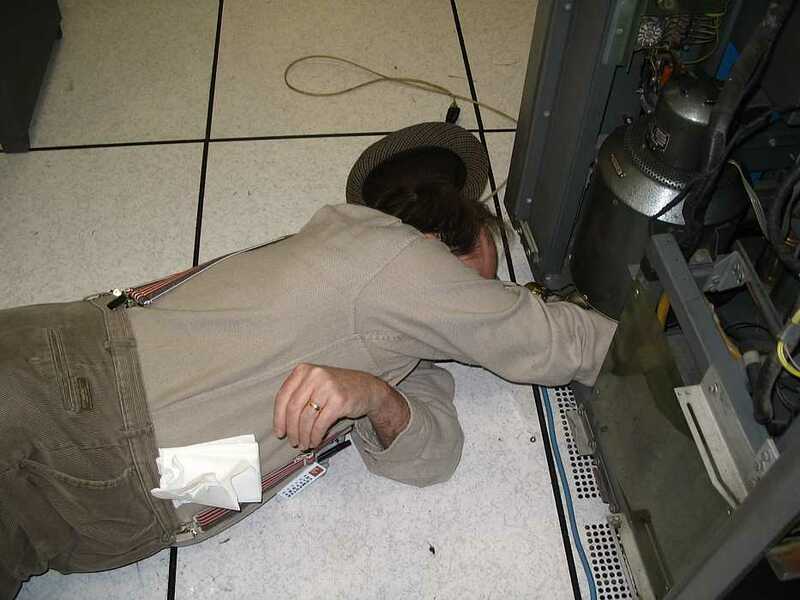 It was essential for troubleshooting the intermittent bug described below. The WriteTapeMark (WTM) instruction was not working. When executed the CPU hung waiting for the TAU to complete the instruction. I replaced a card in the WTM logic to fix the problem. The A, B, and R/W registers are reset to zeros at the beginning of a character time and bits are set to one based upon the character received on the Tape Channel Read Bus. This is interesting because data from the 729 passes through the A-Reg or B-Reg to get to the R/W-Reg. I set the scope up to trigger on activation of the Error latch and started looking for the cause of its activation. I found a 1 microsecond glitch that occurred 85 microseconds before the Error latch activated. 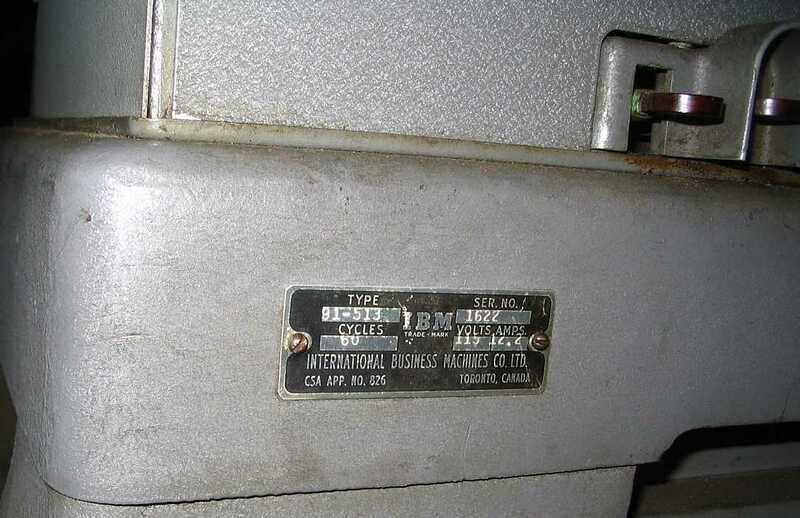 The glitch originated in the 729 and was passed through the A-Reg, but was too narrow to trigger the A-Reg latch. Either the R/W-Reg latch was faster or the logic along the path stretched it slightly. 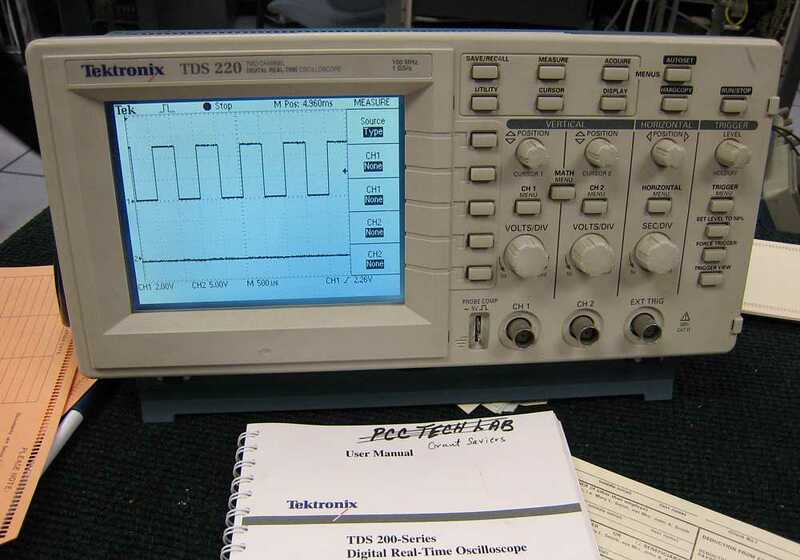 The glitch's root cause was noise in the 729's read pre-amp. The gain on all the read pre-amps were set much too high. Instead of 8Vp-p, the signals (measured at the 1401 to 729 interface) were 12 to 14Vp-p.
We previously set these levels to 8Vp-p, but I think that we made substantial 729 power supply adjustments after that. The adjustments must have seriously impacted the levels of these signals. I remember during our first the pre-amp level adjustment, the adjustment pots were set at their upper limits to obtain the 8Vp-p level. Now the pots are set much closer to center. After these level adjustments, the above error still occurred, but much less frequently. I then ran the tape diagnostic battery as a batch. Move Tape, Load Tape, and Tape VRC diagnostics ran without error. The Backspace/Skip diagnostic was last in the batch and the card reader started mis-behaving. After several read attempts I got this diagnostic loaded, but multiple errors were reported. I am not sure that the diagnostic program loaded correctly. 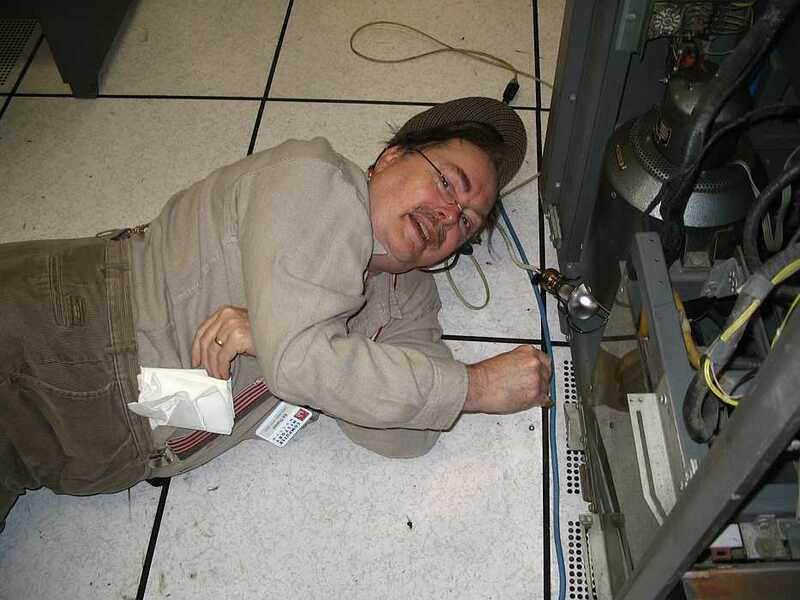 I did not try to run the Card to Tape diagnostic today. 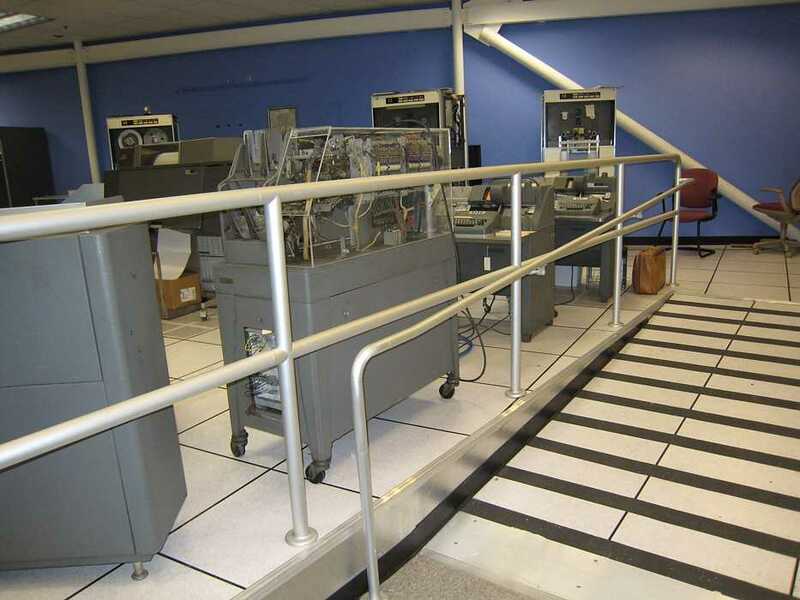 are printed in normal print 130 characters wide. DISCONTINUED IN FAVOR OF THE 360/25. CARDS (WHICH ALSO WORE OUT AND HAD TO BE REJUVENATED VIA DUPLICATION). 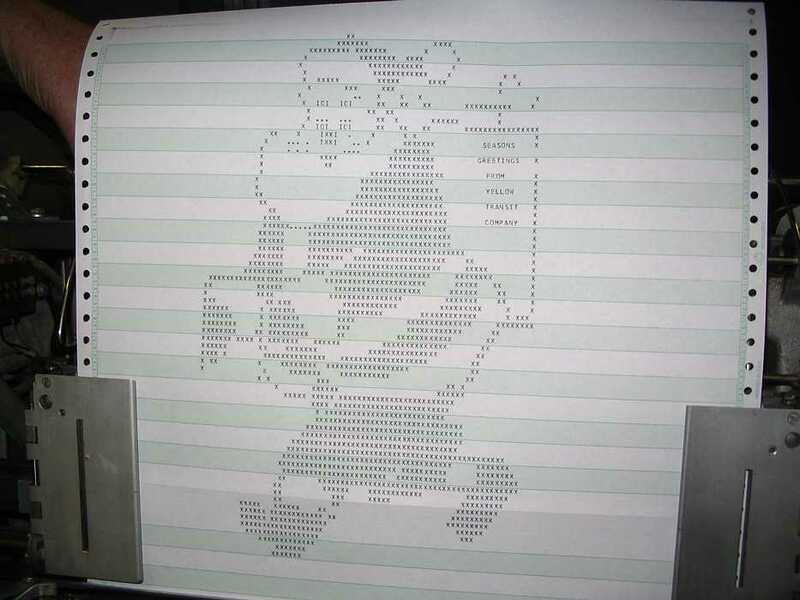 THOUGH A CHARACTER WAS 8 BITS WIDE, THE TERM "BYTE" HAD NOT BEEN INVENTED YET. "0" DEPENDING ON THE CLOCKWISE OR COUNTERCLOCKWISE DIRECTION OF THE STORED MAGNETIC FIELD. 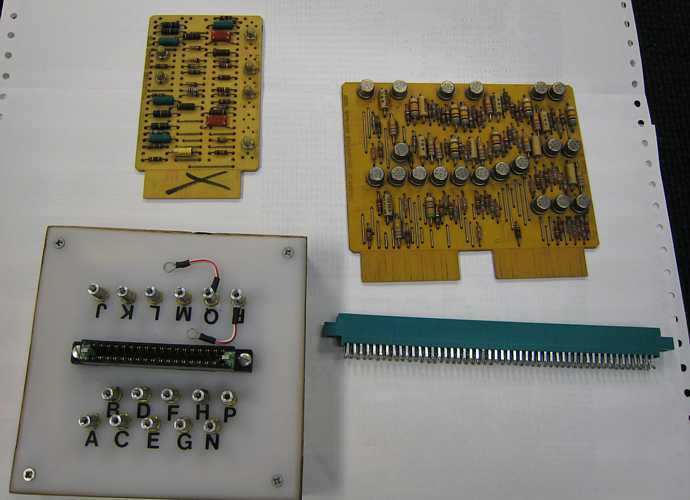 COMPONENTS (10,000 TRANSISTORS AND 14,000 DIODES ON 3,000 CARDS). (OR $30 TODAY). 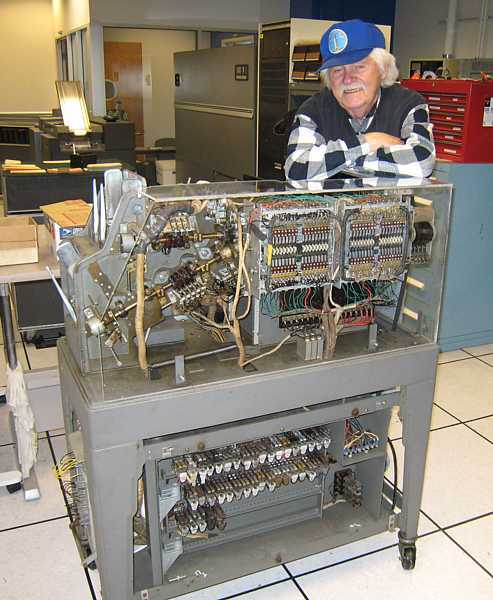 THIS IS 300 MILLION TIMES MORE EXPENSIVE THAT TODAY'S COST OF MEMORY (ABOUT 0.1 MICRO-DOLLARS PER BYTE). Present were Ron Williams, (Bob Erickson was attending to a sick car - head gasket :-((, Allen Palmer, Glen Lea, Ed Thelen. The reworked, checked 140 pound power supplies were dollied from the work bench area to the 729 area. 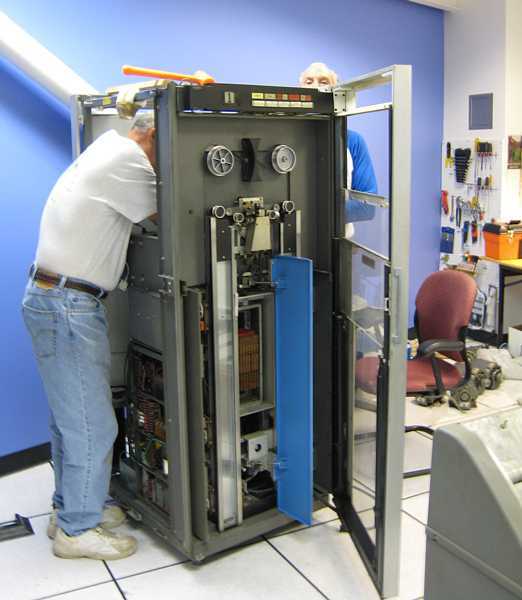 Allen and Glen started	reassembling the tape drives. 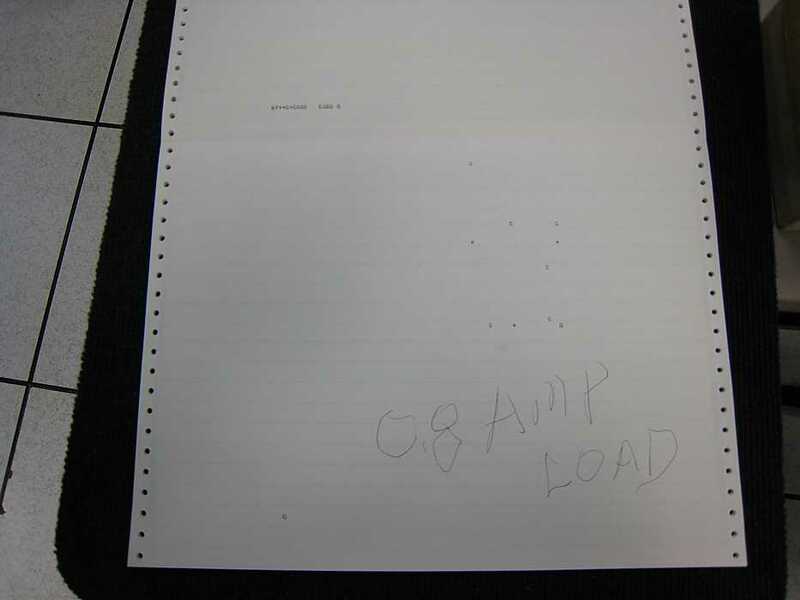 Ed took pictures of previous printouts of the 1402 card reader miss-reads of cards. This was using the 1402 card reads of a deck of all 80 colums of non-printing Group Marks (punches 12-7-8) which yield printing characters of a hole is not read. 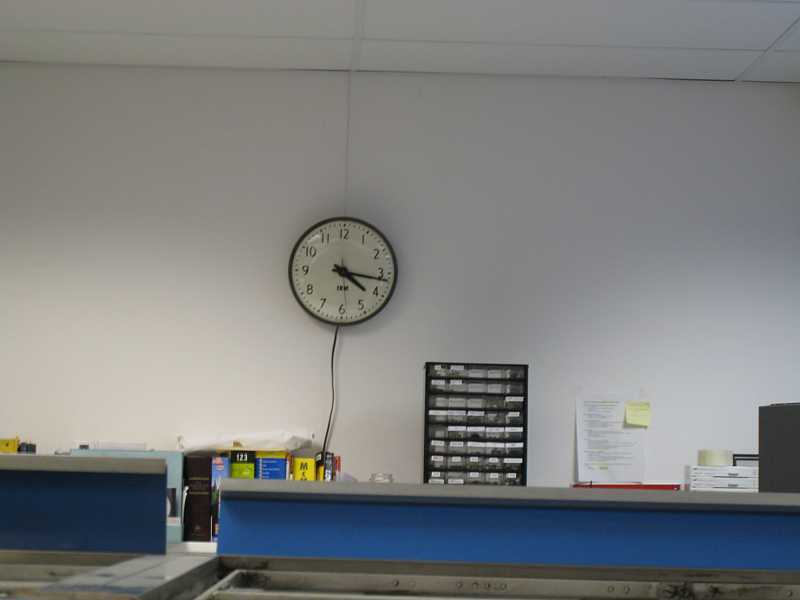 (12-7 prints as G, 12-8 prints as H, 12 prints as +, 7 prints as 7, 8 prints as 8, 7-8 is no-print). By then it was almost "go home" time - and Allen had still not seen the little present that Ron had prepared for him ;-)) We just gotta have a little fun, and Allen says that he likes Camaraderie. Oh Yes!! 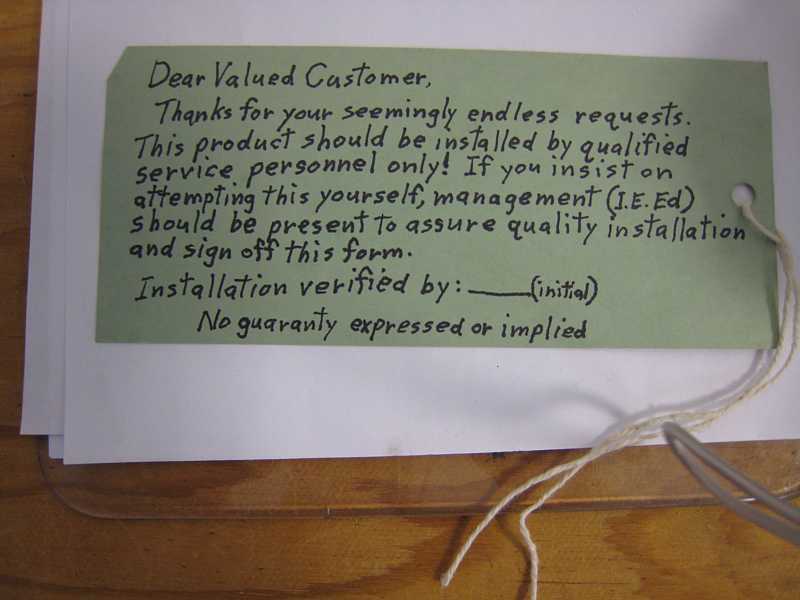 This is the tag which was attached to the new bracket that Ron had made for Allen's magnifier extension lamp. And this is the bracket and mounting plate, made to replace the failed plastic bracket for Allen's portable magnifier lamp. 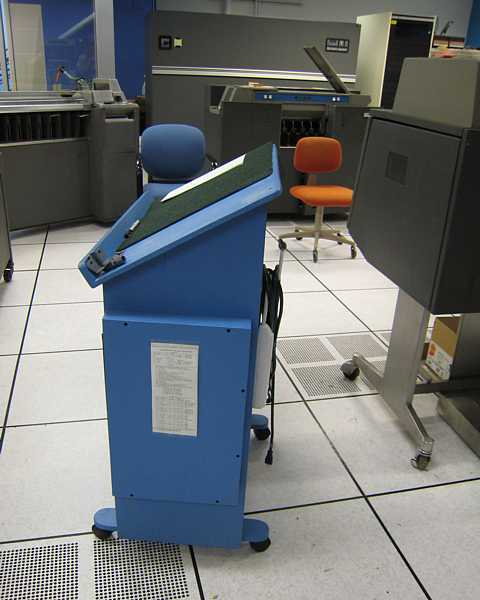 Ron Williams had made a podium (to hold open schematics) similar to this for himself. Allen admired it so much that Ron made this identical one for Allen. 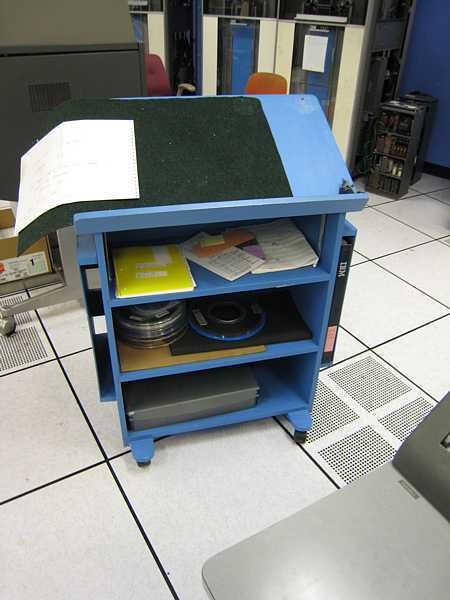 Note the IBM Blue paint. 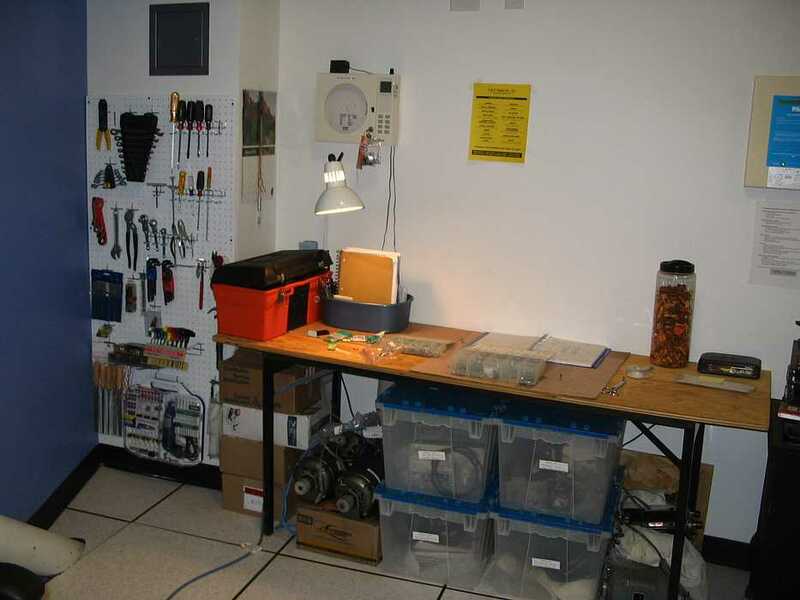 Note the power strip Allen added to the rear to better connect his magnifier extension lamp and other electric devices. After a great deal of heckling, the project is finished (very properly done). Everything snug and tight - nothing wiggles. People were around to help tease, and admire Now I don't have to feel so embarrased for some late software projects I have heard about. in the circuit, I removed it. The noise disappeared. We replaced the card with one from the other 729-V drive. No noise. card is now in the "Bad Cards" box. switches to change the bit pattern. These results are very encouraging. 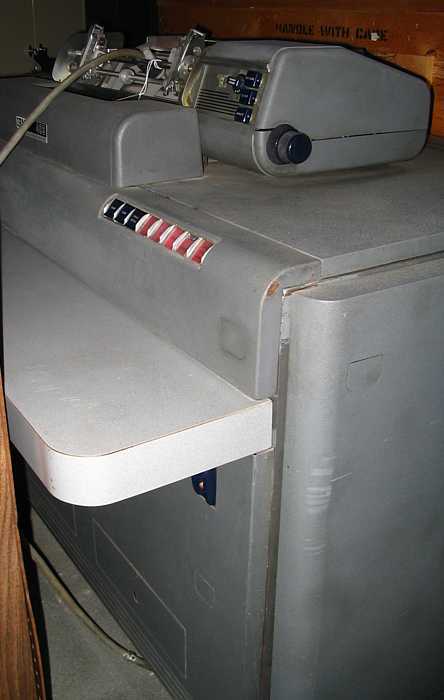 We were unable to run tape system diagnostics due to the broken card reader. 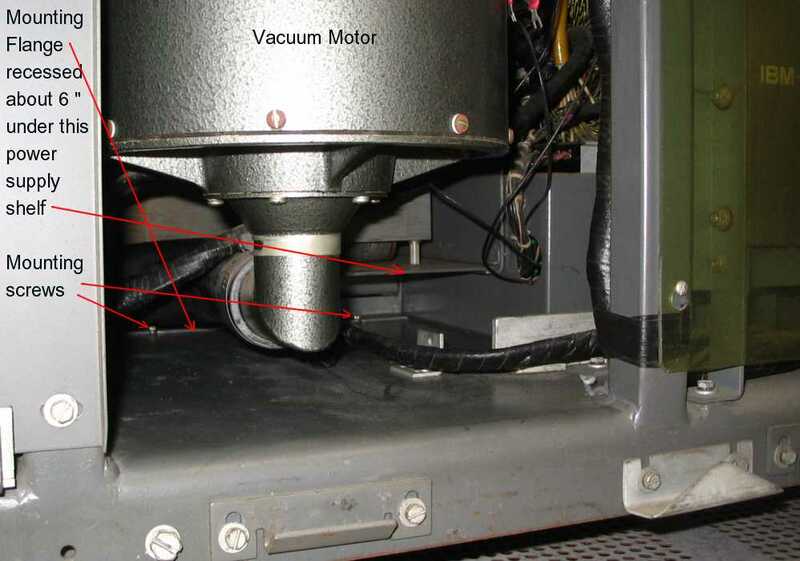 magnet is too far away and frequently does not detect the capstan being in. on the transition of high-speed to low-speed. functional 729 is missing. Allen, do you have it? and again today, but follow-up will probably be needed. some other noise source in the room. > > These results are very encouraging. > > The BJ card contains no active components. > What the heck does it do then? (Like "junk DNA?" > Perhaps problem is a bad cap? Card Feed problem disappeared, bad contact?? Harlan Snyder showed up to visit, he got very ill last August - still looks a bit frail. Then will be cruising for a month or so. - the Morgan Hill key board locks up - feed, register, punch one key, then lock. A divide problem cropped up as they left. 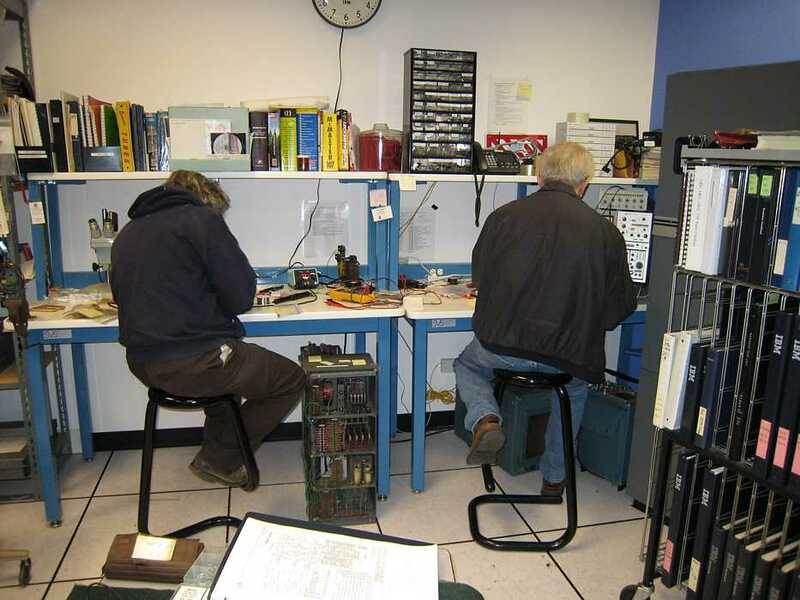 Bill and Frank chased the 1402 card reader motor time out problem, The motors run all day. Allen Palmer - worked hard in his corner. On the test line - final test was an actual CAP Test - essentially payr DFT TEST - particular function - about a whole box, Ripple Read is half a box.